When Vorik was young, he spent several summers exploring the Osana caverns on Vulcan, which included some particularly advanced rock climbing. Like most Vulcans, as a child, Vorik had a young Vulcan girl chosen to be his future wife when the two came of age. In 2371, he was serving aboard the USS Voyager on its mission to locate a Maquis ship when a coherent tetryon beam scanned the Voyager and brought it to the Delta Quadrant. Shortly thereafter, the Caretaker's array beamed the entire crew of the Voyager aboard for testing. He was returned to Voyager unharmed. In 2373, he assisted B'Elanna Torres with maintenance on the plasma injectors during the ship's visit to the Nekrit Expanse. He also adjusted the control interface on Neelix's food replicators and was present in engineering when Neelix came down to steal some warp plasma. Later that year, Vorik surprised Torres by reserving a table for two at Neelix's luau with a view of the lakeside. Torres had mentioned in a conversation five days previously that she enjoyed the view. Later, he worked with Torres and Harry Kim troubleshooting the ship's mysterious engine problems. Vorik experienced his first pon farr on stardate 50537. Believing his intended bride would have declared him lost and lacking another Vulcan mate, he declared koon-ut so'lik, the desire to become one's mate, with Torres. After a brief physical contact was made between them, Vorik accidentally initiated the Vulcan telepathic mating bond, which caused Torres to suffer the same neurochemical imbalance that Vulcans undergo. Vorik's pon farr was ended when he and Torres fought in the ritual kal-if-fee. In 2374, Vorik participated in Voyager's failed attempt to open a transwarp conduit. He controlled the temporary tachyon matrix that was set up in the main deflector and subsequently, when tachyons began to flood the warp core, tried unsuccessfully to stop the leak. When the Voyager was forced to land on a demon class planet, Vorik and Torres tried to keep the life support systems online. Vorik advised Torres that they shouldn't "lose their cool" - a phrase he learned from Tom Paris. Torres stated there was "hope for him yet." In 2375, Vorik was also a member of the development team that designed and built the Delta Flyer shuttlecraft. He was initially assigned to be on the trial-run team, but Torres insisted on replacing him. Later that year, Vorik, along with crewmates Tuvok and Jarot, was suspended in a transporter loop to avoid detection from Devore inspections who were seeking out telepaths. In late 2377, he assisted Torres in repairing a damaged power conduit in main engineering. Later, when The Doctor was impersonating Lieutenant Torres, he asked Vorik where they kept the spare gel packs. Vorik was confused about why she wouldn't know this, but reminded her that they were in locker gamma-5. She acted surprised not to remember, but then looked lost. Vorik reminded her that locker gamma-5 was "on the upper level", to which she responded angrily, claiming that she knew where they were. Vorik hadn't realized at the time that "Torres" was actually The Doctor in disguise. Later, when The Doctor impersonated Chakotay and told Torres to evacuate engineering, Vorik led the engineering crew out while Torres tried to stay behind, unaware that there was no actual breach imminent. Following Voyager's safe return to the Alpha Quadrant in late 2377, Starfleet Command made special allowances for the crew in promoting all Starfleet officers two steps in rank if they remained in the service, thus Vorik was promoted two steps up to a full Lieutenant. 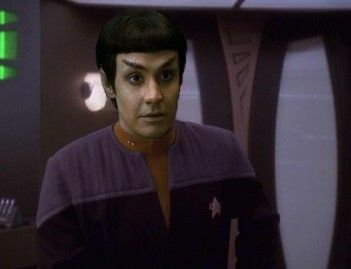 Following, Torres departure from the ship, Vorik was also appointed as chief engineer, under the command of newly promoted Captain Chakotay.